It’s one of the smallest items on your caravan, but it carries a huge responsibility. It may surprise you to learn that instances of caravans detaching themselves from the towing vehicle are on the rise. To give you a better idea of how frequent claims of this kind are becoming, we compared the number of detachment claims recorded in recent years – shockingly there were 80% more made 2014 than in 2010. Detachment is a serious consequence of poor towing practice. It’s important to check that the breakaway cable has been correctly fitted before each journey to avoid serious accident or injury. Here’s the very latest on breakaway cables. What is a breakaway cable and what does it do? This is a straightforward device that acts in an emergency to engage the brakes of a caravan should it become detached from the vehicle that’s towing it. In doing so, it’s likely it will detach itself from the caravan and/or its clip will straighten out. The breakaway cable works by actually breaking itself. Hence, once operated, it should be replaced immediately. It has been a legal requirement since 1982 to have a breakaway cable fitted to a car and caravan outfit. Do note this article refers to braked caravans weighing over 750kg. But don’t worry. The cost of a breakaway cable? Less than a fiver. Industry body the NCC (National Caravan Council) is stressing that replacement breakaway cables are OEM (Original Equipment Manufacturer) and/or approved by your caravan’s manufacturer, arguing that non-OEM products might not be sufficiently robust for their intended purpose. It is possible to accidentally set off the breakaway cable – for example by driving off and forgetting it’s still attached. It’s always worth thinking about carrying a replacement. 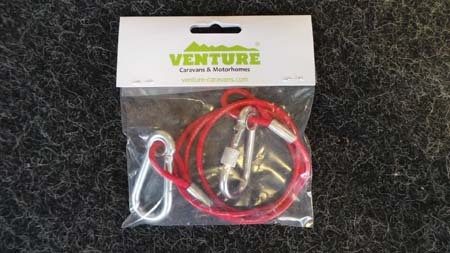 They might look similar in these images, but there are two types of breakaway cable suitable for car/caravan outfits – one with a standard clip, for looped attachment; the other a more heavy-duty carabiner for direct attachment to a designated point. Needless to say, the correct attachment of caravan to car is your responsibility, as the driver of the outfit. It’s also up to you to ensure it is “fit for purpose”. Checking the condition of the breakaway cable is also part of the annual service requirement for any caravan, again as specified by the caravan trade body the NCC (National Caravan Council). Meanwhile, however, if it looks damaged or worn, get it replaced. As we say, it’s only costs around £5 to get a replacement. Do note, also, it’s a condition of your annual caravan service that the breakaway cable is inspected and, if required, replaced. Most workshops will replace it if there are signs of fraying, damage to the clip, any wear and tear etc. New designs of towbar are now approved to UNECE Regulation 55, instead of usually confirming to Directive 94/20EC (Reg 55 was always an accepted alternative). The relevance of this to breakaway cables is that Reg 55 requires the towbar to have a designated breakaway cable attachment point, which 94/20 never included. How should a breakaway cable be fitted? If you haven’t already, best practise is to have a rehearsed procedure for hitching up your caravan to your car. 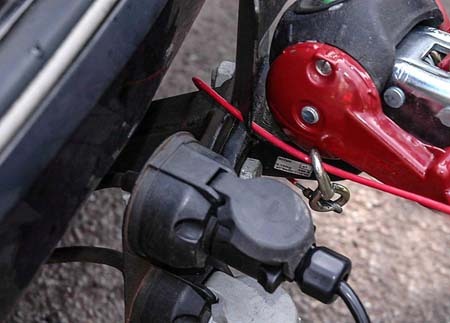 It’s best to fit connect the breakaway cable after you’ve made sure the caravan’s tow-hitch is correctly attached to the towball. 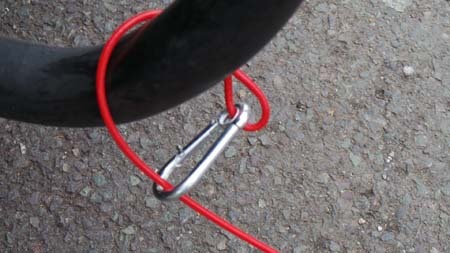 Some towbars have special attachment rings for the breakaway cable. Or, you’re advised to loop it around the bar. In essence, the attachment should be as close to the towball as possible. The cable can be looped around the towball neck if there is no other obvious way of connecting it. However, do make sure it doesn’t foul the coupling head. It’s is vital there is sufficient slack in the breakaway capable to ensure it doesn’t accidentally apply the brakes, for example when you’re cornering. Also ensure it doesn’t drag on the ground when you’re driving along. *It is a legal requirement that a breakaway cable is fitted and properly attached. *Ensure that the cable is routed directly to the car without loops or kinks and through any guides in the caravan drawbar. Always replace any damaged cable with the relevant manufacturer’s spare to make sure it functions correctly. *The cable should be looped through the large diameter hole or loop in or on the towbar and then clipped back on itself. The cable hook should NOT be clipped directly to that hole as this may lead to premature failure, unless the cable is designed for direct attachment. 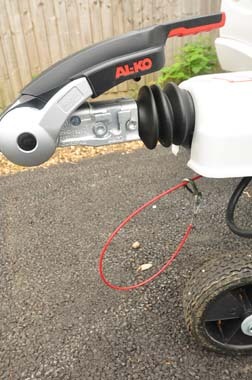 *If there is no suitably sized hole or loop in or on the towbar, the cable should be passed around the neck of the towball beneath the coupling head and then clipped back to itself. *The breakaway cable should be long enough that it does not attempt to apply the brakes whilst in motion, particularly around corners, but not so long that it can contact the road or become wrapped around some part of the front of the caravan when in use. Make sure that the cable is not or cannot be entangled with the electrical cable and/or any external stabiliser in place. A new test for towbars was introduced towards the end of 2012, aimed at bringing them more into line with car manufacturing standards. Called the Carlos Test, it’s a three-axis assessment that’s more arduous than the original type approval single-axis shunt test, which didn’t really take into account vehicle body fatigue. It also includes a pull test of the breakaway cable attachment point, with limitations on the maximum distortion permissible at such points. The UK’s leading towbar manufacturer, Witter, has published news about the Carlos Test – see here for details. You can also find out more about towbars for vans/van conversions on the Witter website. For more about the European Directive EC94/20, see the Tow Trust website. Caravan Guard guides aim to give you an introduction to a specific product sector. But, we’re always keen to hear from you if you want to share your experiences and/or key advice with other Caravan Guard fans. Scroll down to add your comments. If the breakaway cable snaps when caravan has detached from caravan how quick do the breaks work and if so will it stop a caravan on a hill? The breakaway cable should pull on the brakes immediately. That’s why the strength of the breakaway cable is so important. Hi what is the difference between a RED breakaway cable and a YELLOW cable. The cables come in a variety of colours (and packaging). Those produced by the chassis manufacturer Alko are red, those by BPW are blue. There are a number of other options provided, other than by these two manufacturers. We would suggest that owners seek to fit the cable produced by the original manufacturer of their caravan or trailer, as the braking system is part of the ‘approval’ process for the trailer chassis. The option to source from any other manufacturer is available. Is there any difference in the breaking strain of red , black or yellow breakaway cables ? There are no markings on breakaway cables to provide “breaking strain information2 so it’s difficult to say. ALKO and BPW are the two leading manufacturers of braking systems for touring caravans – so where possible would suggest using the cables that are provided by these manufacturers. If someone is dim enough to incorrectly mount a detatchable tow hook so that it comes adrift whilst driving, I would suggest they stay at home and do crosswords. They should not even be driving a car never mind with a caravan on tow. Equally if people have been towing not knowing what a breakaway cable is, they also need to stay indoors. It is dangerous enough out there folks. Stay home. I use a ‘caribiner type’ breakaway cable and carry a spare. As recommended, it is the first thing I do when the tow-hitch has been connected correctly. I use a simply-remembered nemonic when connecting the caravan to my car: J C B – J for jockey-wheel, lifted, clamped and secured; C for cables, break-away, electrics and checking; B for brake released. I recent times, I have added M for motor-mover, the operating-handle for which I place beside my seat in my car. A simple approach but it works for me. I have a detachable tow ball & was told at a dealer the breakaway cable should be looped round the ball instead of clipped direct to the eye on the main tow bar. I think this is wrong if the detachable ball came off the brakes will not operate. Can you clarify please. If this was to happen the insurance company would throw a claim out. I resting reading and all good information, but your article states that a cable with the heavier duty type of carabiner is for direct connection to, your final picture shows this type being used as a loop coupling, is this correct ? I’ve spoken to the Caravan Club’s Technical Manger regarding both your queries. 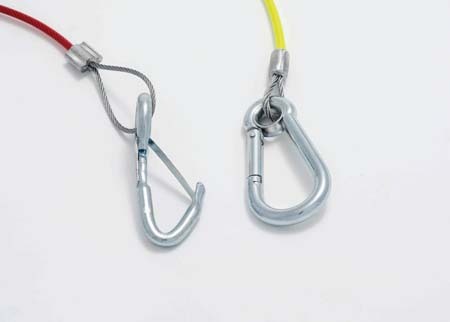 The general rule is that if there is no suitable attachment point, you can indeed use the carabiner as part of a loop around the towball fitting. ‘Looped around’ attachment is an acceptable option, although some people get concerned that the loop of cable might jump off the towball instead of allowing the cable to operate effectively. an imortant point to remember is not to loop the cable round a removable towball but to make sure you use the attachment point provided. If the towball is fitted incorrectly and detaches from the car the breakaway cable will not operate. I’m happy with the cable advice but would like advice on a related matter. CanI use WD40 to lubricate he tow hitch that the tow ball sits in? I know not to use grease! a) clean all parts thoroughly. b) Areas may only be covered with a thin film of grease (Fig. 20). c) Use multipurpose grease DIN 51825 KTA 3K. See here (page 5) for further details. I think we need to point out that for lighter trailers, for example smaller trailer tents without brakes, that what is required is a Secondary Coupling, I.e. a cable or chain which is just the opposite to a breakaway cable in that it is designed to remain intact and unbroken if the ball hitch neck or coupling breaks. It is best fitted to a tough bracket bolted to the towbar. It too, is reasonably cheap but is vital to keep the trailer from running away in the event of catastrophic coupling failure. I had a very frightening decoupling experience where the breakaway cable did not work. i coupled the caravan on my drive and set off. I had travelled about a quarter of a mile and turned off a roundabout down a shallow incline. I felt a bump and immediately braked, looking in the mirror I could see the caravan had detached and was overtaking the car. it continued past my car without hitting it and then returned to the correct side of the road. i was then following the caravan. it veered across to the left where the jockey wheel found a small gap in the kerb and pulled the van onto a soft verge where it ran into some bushes and stopped. when my heart started beating again I examined the van. luckily there was hardly any damage, just a few scratches from the bushes, but the breakaway cable connection link was pulled straight but had obviously not operated the brake. As soon as possible I had the van inspected by the dealer who could find no faults. His presumption was I had braked before the cable had operated and it only snapped away as the van was passing by the car. the snapping action was sideways on to the caravan hand brake so did not operate it. A set of unique circumstances which may never have happened before or will ever happen again. The dealer explained the simple system of winding the jockey wheel down, after attaching to the car, until it lifts the front of the van slightly and pulls up on the towball.This is a foolproof (?) method of ensuring a good connection which I now use every time. I still have nightmares about the consequences if the van had veered in the opposite direction into the oncoming traffic.